It's still winter in the Northeast U.S. as of now (mid-April). Thinking it may be warmer down south, Sara and I loaded our bikes and headed down to Tennessee & North Carolina for the weekend. Trouble was, the cold followed us. 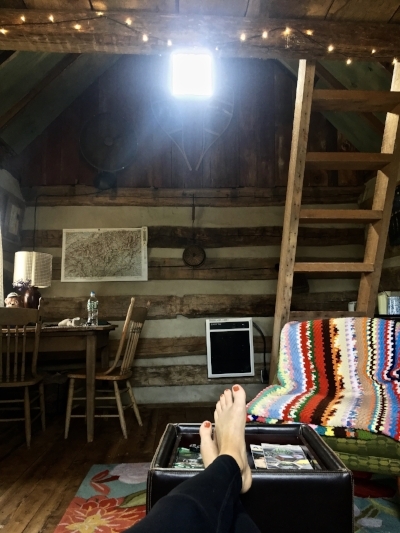 Read on for our cold Smoky Mountain bike trip, plus tips on winter skincare. 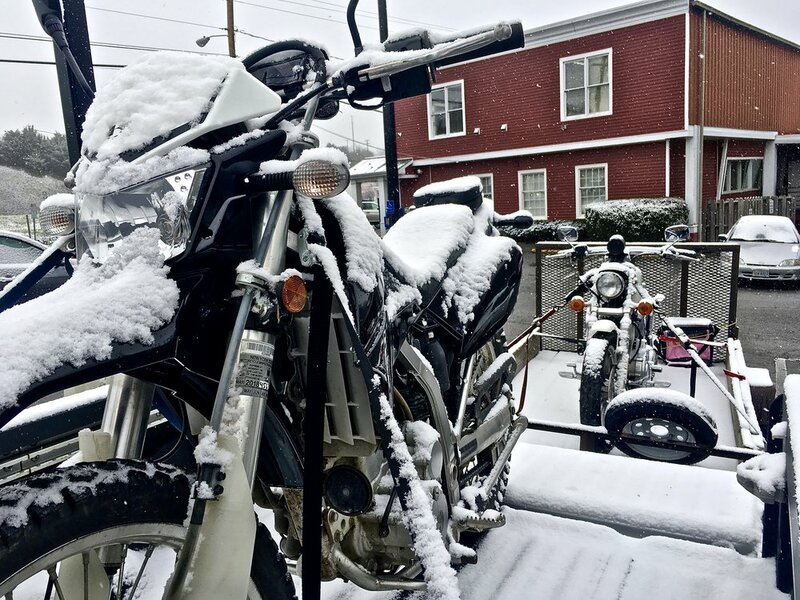 Waking up to snow on our bikes, somewhere in Virginia. It was a 12+ hour drive, and I ended up riding my bike once. Once. For those of you who like to ride in warm weather only, take if from me - don't go to TN/NC in the spring. Wait until at least June. Or July if your body really has problems heating itself. Sara was a trooper and did the cold ride up the National Park, while I made the tough decision (not) to leave my bike at the cabin and ride on the back of a motorcycle with another friend. When we arrived in Gatlinburg, TN, we were astounded with how crowded it was. Parking was impossible. It was probably the most touristy town I have ever been to. I didn't even bother taking pictures, as the amount of humans packed onto the sidewalks was somewhat revolting. We opted for a beer & food a ways out of town to relax and escape the chaos. We had to hurry back to our cabin as the rain was coming - we almost escaped it, but the last 20-30 minutes we were riding in the rain. 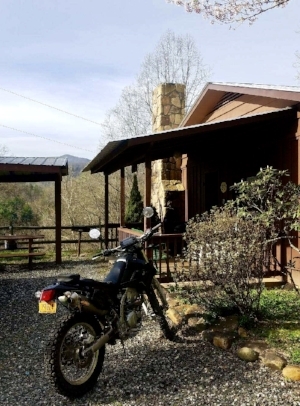 Home Sweet Home - Sunset Farm Cabins - individual cabins with hot tub, grills, fire pit. Reasonably priced & cozy. The small town of Sylva was our go-to for food & beer while we were in this part of the Smokies. O'Malley's Pub & Grill was a local hotspot and didn't disappoint - we got to know the owner and he was a great local tour guide! Cabin with a loft. My favorite. 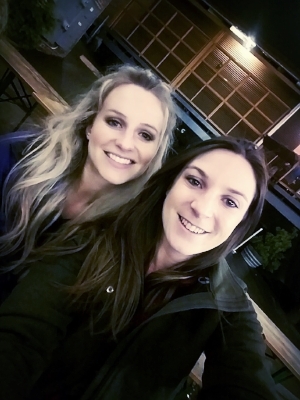 We checked out Wicked Weed, a brewery in West Asheville, that did awesome business - it was so crowded inside, we sat outside in the low 40 degree weather under the heating lamps. On our way out of town to head back up north, we stopped to do a little hike. We originally wanted to do a waterfalls hike, but those trails were closed due to an accident. Our #2 pick was Craggy Pinnacle hike, but the roads to the trailhead were closed (I guess this is somewhat common here - so check the Blue Ridge Parkway Road Closure Map through the National Parks Service for any upcoming trips you make: https://go.nps.gov/brp-map). 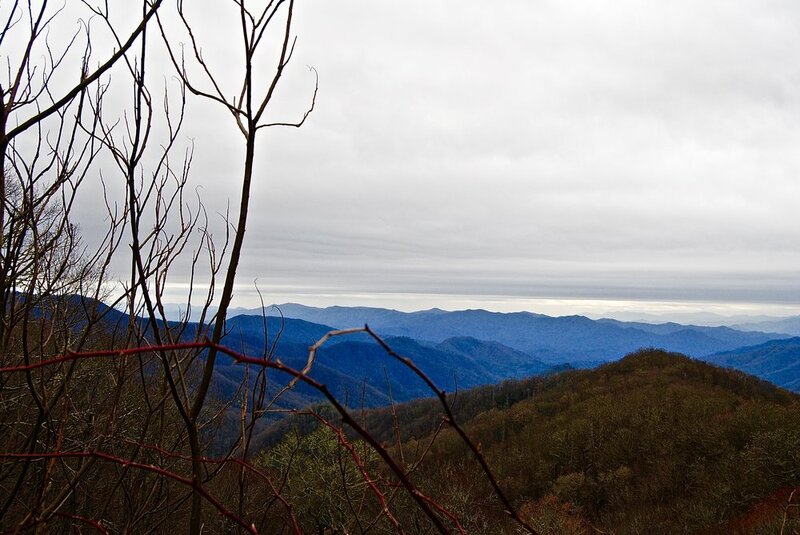 We settled on a short hike (just over a mile) called Lookout Trail, with decent views, located in Montreat, NC. 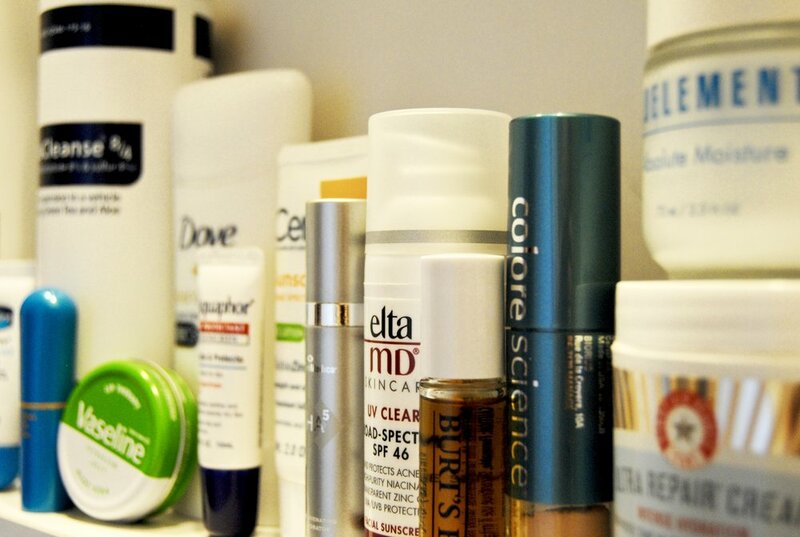 Though it's mid-April, my medicine cabinet is still full of my winter skincare. And probably will be for the next month or two, until spring decides to show up. "What do you use? What's in your medicine cabinet?" If you live in a harsh climate, your skincare needs change with the seasons. It's important to tweak your products with the changing of the temperature & humidity. Skin looses moisture during the winter months, and lack of sun can lead to flares of inflammatory skin conditions such as acne, psoriasis, and eczema. I love Eucerin products - scent free, dye free, & sensitive skin friendly...I usually have their Skin Calming Lotion on hand (has oatmeal as an active ingredient, read more about that in this blog), but it's all used up at the moment! *Prescription only - and totally worth it. It's a cleanser with 8% sodium sulfacetamide and 4% sulfur, in a vehicle containing green tea and aloe (read more about sulfur products here). In the winter when my skin is super dry, instead of using it as a wash, I just use a pea-sized amount and mix with a moisturizer and leave it on my skin. The best part? No sulfur smell. I promise. I don't use this every day - just when my skin is feeling really congested and needs a pH-rebalance. Nice for us combo-skinned people. 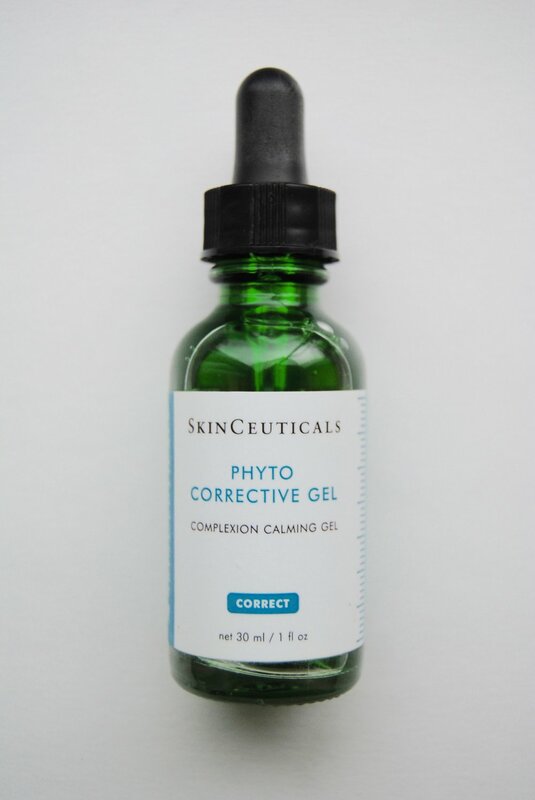 This is a new favorite of mine - nope, it won't help with moderate-to-severe cystic acne, but for the occasional superficial blemish, this is amazing. Note: this does contain denatured alcohol, so just a dab will do. For highly sensitive-skinned people, may not be the best choice for use on the face. 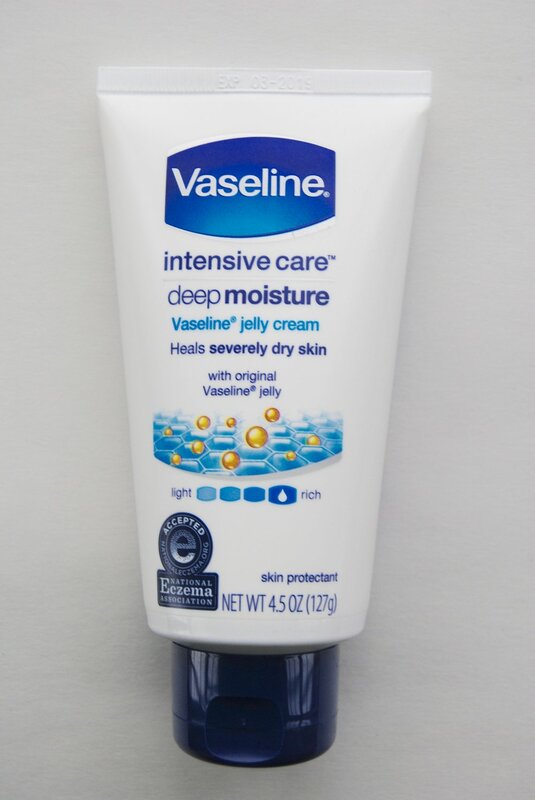 Vaseline should be a staple in every winter skincare routine. This stuff is a cream formulation - though not as penetrating as the original Vaseline ointment, it still does a great job for dry hands and cuticles. Please, for the love of all things good, just use Dove deodorant. I can't tell you how many times I've seen patients (males & females) in the office with open wounds under their arms from their Axe & Old Spice. With colloidal oatmeal as the active ingredient, this stuff is my winter staple. Good for face + body. Read more here. Everyone should apply facial sunscreen, everyday, winter and summer. Make sure it contains a good physical block (titanium dioxide or zinc oxide). This is a good dupe for EltaMD's sunscreen (next product). Love, love, love. Fragrance-free, oil-free, paraben-free, sensitivity-free, & noncomedogenic. This will probably have it's own blog post at some point. Authorized retailers only. Made by Alaska Glacier Mud Co. This makes your skin tingle just enough to make it feel good, not irritated. Try to mask on a weekly basis. 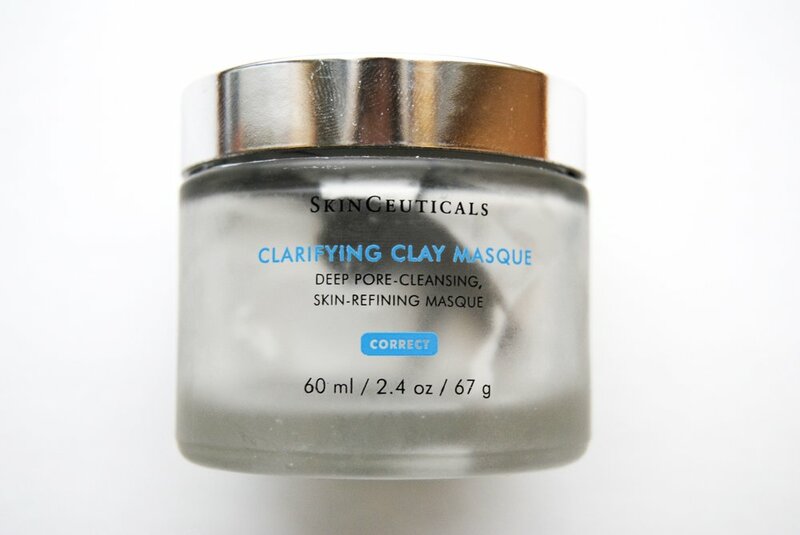 Formulated with 5% hydroxy acid + aloe and other plant extracts, this mask really is a "deep pore-cleansing, skin-clarifying mask." Authorized retailers only. 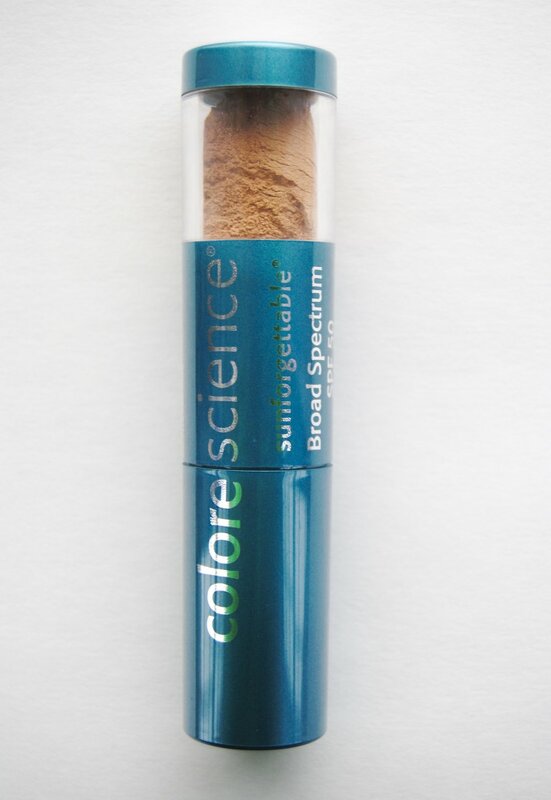 What a good invention - instead of applying a cream/liquid sunscreen every two hours while outside, how about brushing on a mineral powder with SPF 30? Won't mess up makeup, and 100% protection. Authorized retailers only. Serious hydration in serum form. Five hydrators to replenish your skin's hyaluronic acid. May not be suitable for acne-prone skin. Authorized retailers only. This complexion-calming gel is worth the price. I use it immediately after I mask to neutralize facial redness. It lasts a long time, and I love the dropper packaging. Authorized retailers only. This "bi-functional resurfacing and replenishing serum" is a hydrating exfoliant (great for winter!). Hint: Mix 2-4 drops into a face mask for a more exfoliating mask. Authorized retailers only. Those of us who work in dermatology love our Vanicream products. In the winter, get yourself some of this ointment - great for hands, cuticles, lips, heels. *Prescription only - Another sulfur product, with added emollients to decrease dryness (also great for winter). Read more here. This anti-aging moisturizer smells amazing (lavender + rosemary essential oils). Formulated for "mature skin" - but hey, it's never too early. Authorized retailers only. 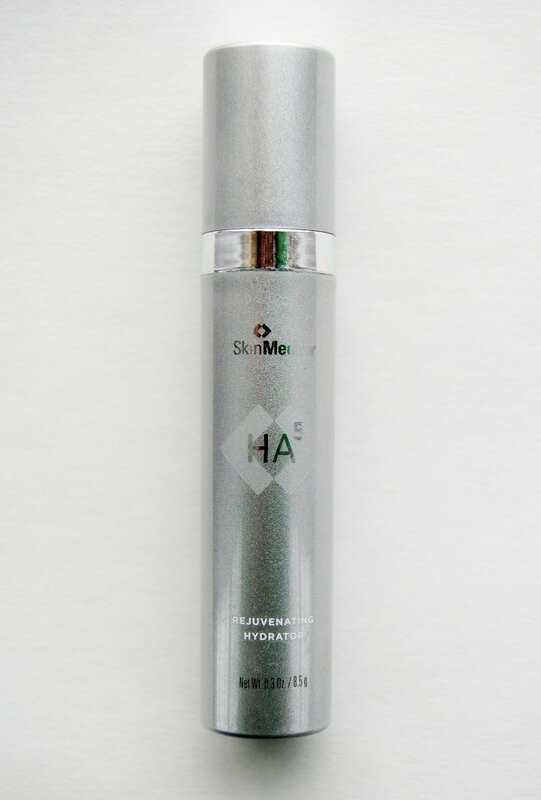 This heavy-duty anti-aging serum is applied at night - I use in the winter only. Authorized retailers only. My favorite serum! I use this in wintertime only for extra moisturization. Make sure to apply serums before moisturizers. Authorized retailers only. *Prescription only - My skin barely tolerates this in the winter months. Or really at all. Use any tretinoin products carefully and sparingly, especially in the winter months! Same as #7, different scent. Can you tell I love this product? 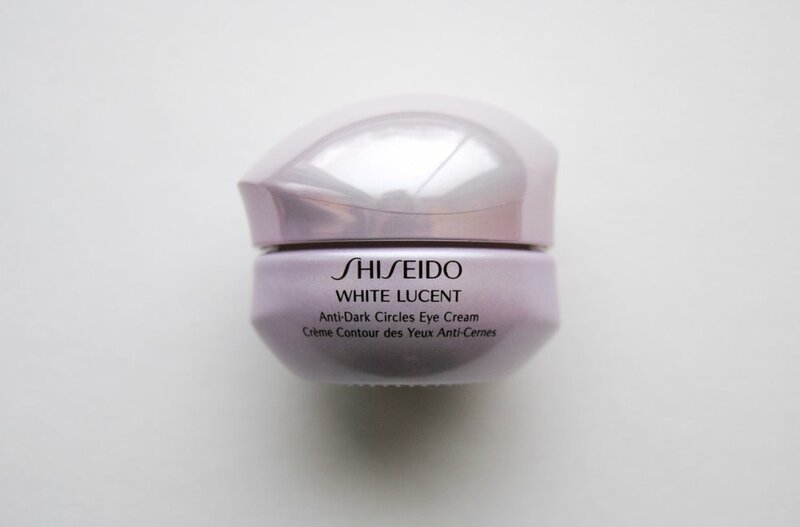 I love Shiseido eye products. Also a fan of their Benefiance WrinkleResist24 Intensive Eye Contour Cream (super moisturizing) and Future Solution LX Eye and Lip Contour Regenerating Cream (cream for crow's feet as well as vertical lip lines). I use this as my daily morning moisturizer during the winter months - it sits nicely under makeup and doesn't make me oily. It's not quite heavy enough for nighttime moisturizer for me during the cold months. Authorized retailers only. My #1 lip product for winter lips. I have so many of these. If I don't use these throughout the day, my lips get cracked and bloody. Great for cuticles, too. For those of you who don't like the idea of the tins. 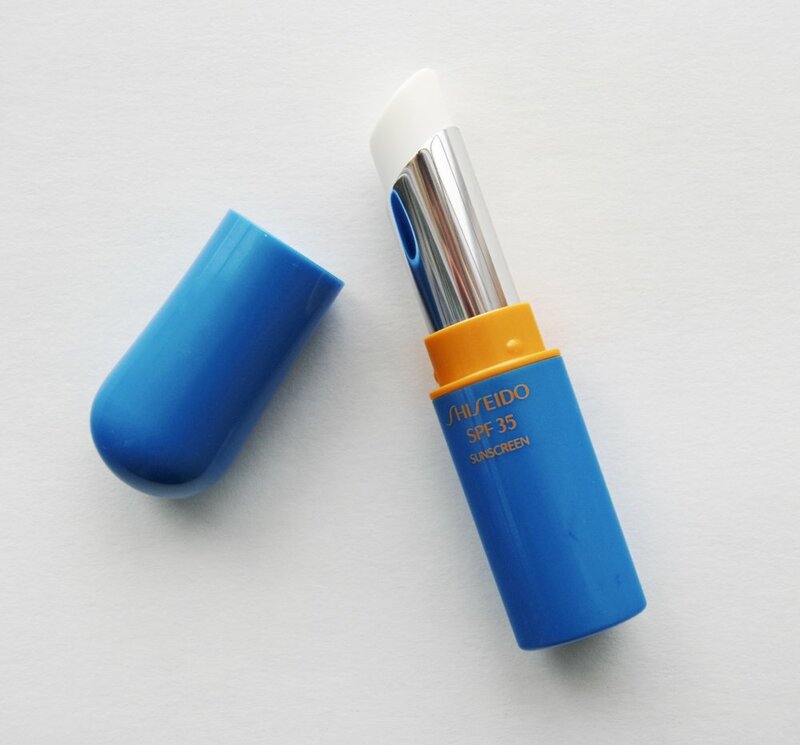 Your lips need SPF, too. I take way too many skin cancers and precancerous spots off of lips, as they're often forgotten. Plus we love our Aquaphor. I love the packaging and how this luxuriously applies to the lips - super silky & smooth. My fellow snow bunnies will appreciate this one. Medical Disclaimer: The information on this site is not intended or implied to be a substitute for professional medical advice, diagnosis, or treatment. All content, including text, graphics, images and information, contained on or available through this website is for general information purposes only.